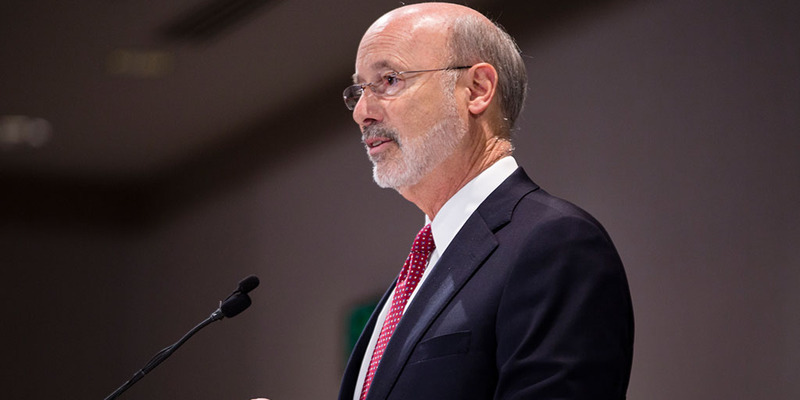 Harrisburg, PA – Governor Tom Wolf today addressed the Pennsylvania Press Club and discussed the need to pass a severance tax, vowing to continue to fight for this common sense measure. “There is no greater example of Harrisburg dysfunction than the House Republicans’ refusal to vote on a severance tax.” Governor Wolf said. “Last week, the House Republican leadership could have called up a vote on this tax on big oil and gas companies, but neglected to do so. It’s well past time to pass a tax on shale. And we saw just that in the past few months after the repeated failure of the Republican House to finalize a budget deal and their refusal to pass a severance tax. “We are still the only natural gas producing state that has not taken this common sense step. The Independent Fiscal Office has said that 80 percent of the revenue raised by a reasonable severance tax would be paid by customers outside of Pennsylvania. Pennsylvanians deserve to share in this prosperity. Prior to the speech, Governor Wolf signed a variety of budget bills. These bills include the Administrative Code (House Bill 118), the Fiscal Code (House Bill 674), Capitol Budget (Senate Bill 651), and the General Assembly’s revenue package (House Bill 542 and House Bill 271). “Just last week, the legislature finally and reluctantly funded the budget they passed on June 30. While this provides much-needed funds to fix our broken deficit, the process shows that Harrisburg is still broken. I shouldn’t have to draw a line in the sand in order to force House Republicans to do the jobs they were elected to do.